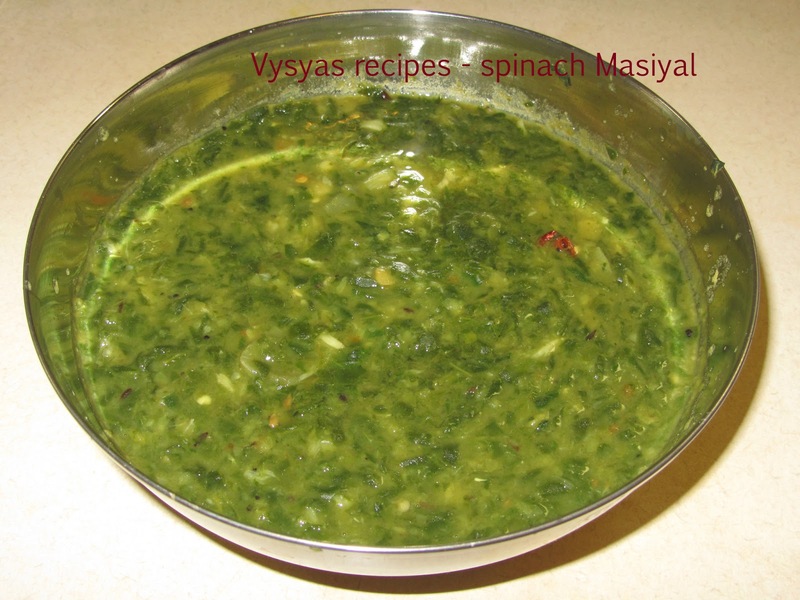 Palak keerai masiyal(palakoora pappu) is prepared with toor dal. it goes very well with rice.Spinach is loaded with flavonoids which act as antioxidants, protecting the body from free radicals. Studies have shown that consumption of green leafy vegetables such as spinach may slow the age-related decline in brain function. So, eat your greens and keep working those crossword puzzles to keep your brain young and agile. palak (spinach) - 1 bunch. toor dal - 4 tbsp. crush garlic and pearl onions together. chop the spinach very finely. pressure cook the toor dal. Heat the oil, add mustard seeds when it splutters add cumin, add hing, add green chillies, crushed onions and garlic saute for few seconds, then saute tomato well. keep in medium flame. when water starts boiling and when spinach is cooked , add cooked toor dal, and salt to it.stir well.let it boil for few seconds.Then keep away from flame.blend well. Then serve with rice. blend with whisk or mathu (heavy rounded wood with long handle) for few seconds till everything combines, which tastes so good. you can also blend with mixie for one run.